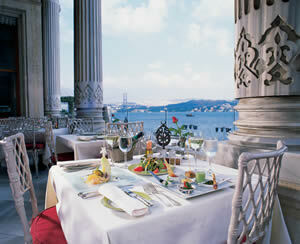 When you are in Istanbul, you will wish to have at least one dinner in a palace. 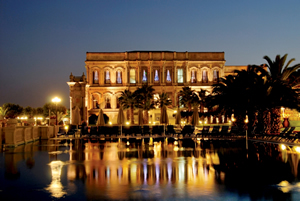 And palaces in Istanbul do not come much more impressive than the Ciraĝan. It was the residence of the last Ottoman Sultans. Now it stands, pristine and newly restored, overlooking the Bosphorus, as a vast reminder of how those rulers liked to indulge themselves with healthy doses of opulence. Within is, I think, the largest crystal chandelier I have ever encountered. I saw it on my way to the first floor, a journey which took me up a staircase which must have exhausted half a dozen quarries of marble. Ottoman Sultans were not, it seems, give to under-statement. This regal progress brought me finally to perhaps the most famous dining room in the Turkish capital – the Tuĝra Restaurant. 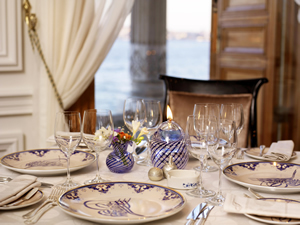 ‘Tuĝra’ means ‘the Sultan’s signature’ – so, for once, we can properly call this a ‘signature’ restaurant. 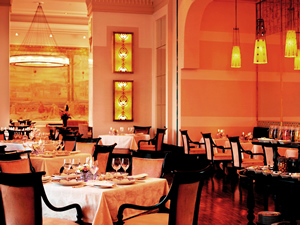 The three high-ceilinged rooms form part of the Ciraĝan Palace Kempinski Hotel. But the Tuĝra is renowned not simply for the splendour of its setting. Gourmets come here rather for the updated version of Ottoman cuisine. And the Ottoman theme is reinforced by the live music, performed by a single lady singer. I confess that, until she began her performance, I was unfamiliar with Ottoman music. I think it fair to say that, to those of us brought up on Beethoven and Cole Porter, it seems slightly ethereal and a little strange. Still, it created an atmosphere which gave me a sense of authenticity, as I tucked into a very enjoyable meal. Another new experience came as I settled myself onto the pale gold velvet of my armchair at table number eight, and looked straight out of the window at the Bosphorus. Along with a glass of Louis Roederer champagne (nothing unusual about that, I hear you cry), came a hot towel, with which to wipe my hands. It was brought by my waiter, Hakan, smart in black tie, who was to look after me very well indeed throughout the evening. This modest ceremony I found charming. I noted the excellence of the fine white damask of the napery, and knew that I was going to enjoy my dinner. The wine list has 300 offerings, and spans the world. Prices range from 75 lira for a Turkish red to 15,700 lira for 1994 Pétrus. (Remember that in Turkey the tax on wines is very high, so you must be prepared for some eye-watering prices.) I noticed 1999 Opus One from California (5,100 lira), 2000 Luce from Tuscany (1,250 lira) and 1995 Margaux from Bordeaux (7,300 lira). My own wines were recommended by the excellent Assistant Head Sommelier, Tuncay Altin. The glass of 2008 Mount Nelson sauvignon blanc (27 lira) was exactly what I expected (and wanted) from New Zealand – grassy and well-structured. And, to show me just how good Turkish wine can be, the 2006 blend of merlot, cabernet and syrah was superb – rich, dense, sweet and oozing with ripe damsons and blackcurrants (Corpus – 240 lira). Thus did I have dinner at a palace in Istanbul. And it was a good dinner in a magnificent palace. If you wish to do likewise, I can, without hesitation, recommend the Tuĝra Restaurant. 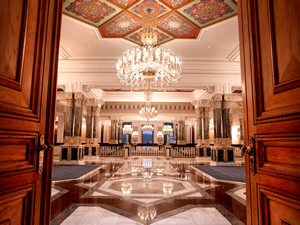 Ciraĝan Palace Kempinski Hotel, Ciraĝan Caddesi 32, Besiktas, 34349 Istanbul, Turkey.